The summer 2014 edition of Oregon Humanities magazine has a short post from Dave Kenagy, “Starting from Osmosis,” about coffee, how much he likes it, and how he began drinking it. It all began at the Brand Café in Redmond in 1956, when Dave was four and went there with his father. Dad a penchant for the coffee, “one dime with refills”; while his father sipped his coffee, Dave took his “by osmosis”; and so his own journey with coffee began. 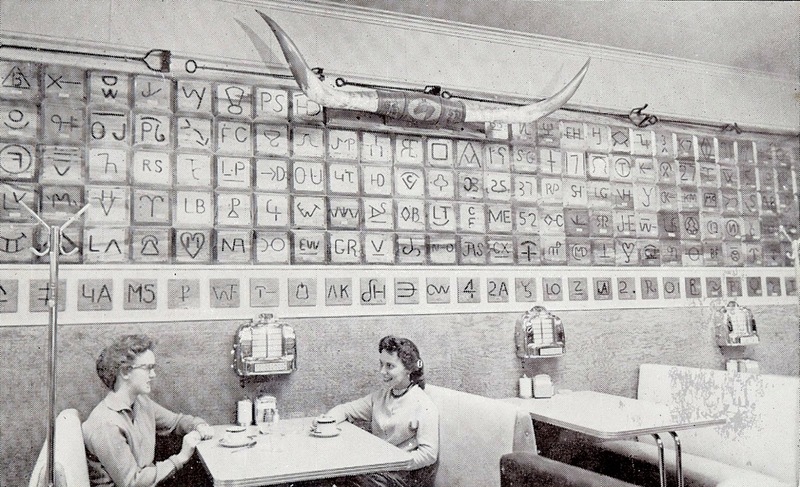 The menu from the Brand Café of about 1955 indeed shows that coffee was a dime. And it wasn’t just any coffee, but Folger’s Coffee, a longtime San Francisco-based brand much favored on the West Coast in the 1950s which went national in the 1960s. And not just a cup for a dime: “Folger’s by the Hour, 10c” proclaimed the menu. As the postcard above shows, the Brand’s décor was spartan, but with a distinctive flair. 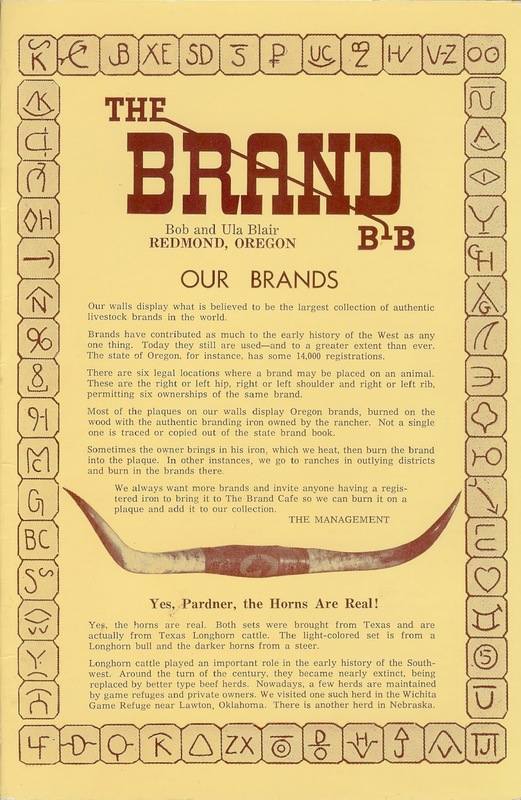 The name reflects the motif, which featured “what is believed to be the largest collection of authentic livestock brands in the world.” Two sets of Texas longhorn cattle horns punctuated the wall of brands. The girls have been sitting below the horns for nearly an hour now, drinking Folger’s ….